Who can beat Superman Cosmic armor? As title states, who can defeat Superman Cosmic armor aka thought robot in a fight. Don't mention TOAA or the Presence. Heart of the Monster Hulk.............lol, jk. Cosmic armor is bigger than the multiverse, what is HOTU going to do? Isn't Hotu just for ONE universe? Or do you mean Hotu is equal to TOAA? No mere reality warper is going to take down Cosmic armor sups, he is larger than the multiverse, if he wanted to he could stomp on it and kill everyone. He defeated Mandrakk, if some reality warper could stop him they would just bring one to stop him. Living Tribunal is an omniversal being, yet he got beaten. I know the HOTU is not really a appropriate name because it sounds like it's belong to one universe. Where did you get that Living Tribunal is omniversal? Omniversal beings are omnipotent. Can we use beings outside of comics? Yeah, aslong as non omnipotent. He was written to be a being seconded only to TOAA, and HOTU is not a being so that doesn't count. Yes, omnipotent being are omniversal, but not all omniversal being are truly omnipotent. TOAA created and designate LT for omniversal jobs only. Living tribunal could beat Thought Robot. Do you have a scan of him beating Mandrakk? Eurgh, no wonder I hate Superman (pre New 52). Way, way, way too powerful for my taste. Anyway, I don't know who could beat him. The closest guesses I have right now. Cosmic armor is bigger than his whole dimension. There are others of course, but I don't want to name such a long list. @Nefarious: Whats cosmic armour and were is that scan in the op from? Beyonder doesn't stand a chance, Beyonder is a little germ compared to the thought robot, and it would instantly get immune to beyonder reality warping. spiderman will obviously beat him. once spiderman picked up a car and threw it. thought robot has never done that. He will make thought robot stick to walls by his webs. and robot will not be able to move. spiderman then punch his cosmic armour and it will break. It was heat of 10 billion suns. And there isn't a specific speed for a thought. Cosmic armor superman is bigger than the multiverse, do you realize how tiny surtur is to CAsups? That one blast was from 10billion suns, but both of them were constantly growing in power. But I will still say Mandakk could pull it off, if he hadn't been thrown off Nil. There is a specific speed for thought actually. It's the speed of electricity, which is just below light speed. In real life it moves at the speed of light through matter which is slightly slower, however in a world where the laws of physics don't matter a though doesn't have a specific speed. The PR Beyonder saw the multiverse as a drop in an ocean in comparison to his dimension. 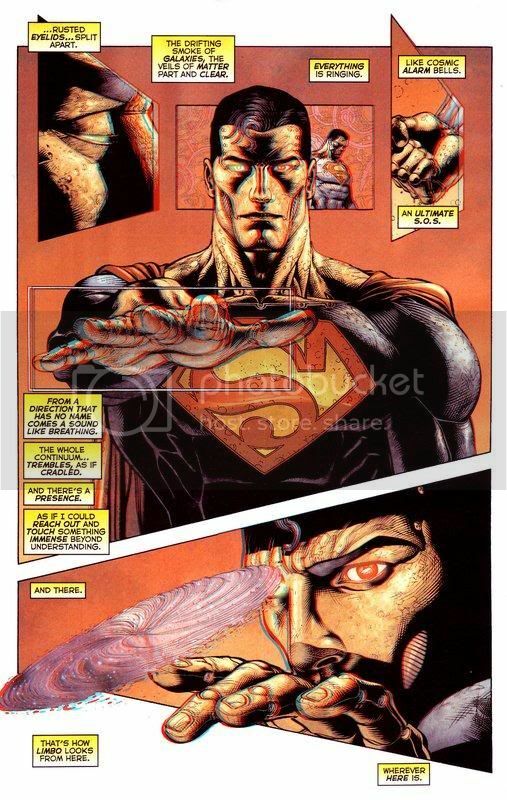 The Beyonder is also larger than the multiverse and is essentially equal to the LT. Cosmic Armour Superman isn't going to be able to adapt to the Beyonder's power if he's blinked out of existence.